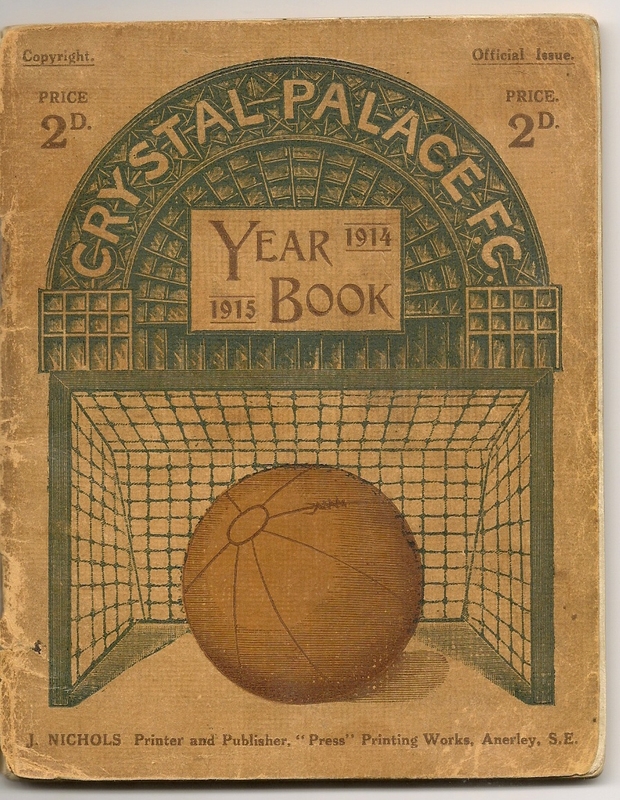 I’ve just obtained my oldest piece of Palace memorabilia, the Palace Year Book for 1914/15, the year they left the old Crystal Palace following the outbreak of World War 1. Really chuffed to get hold of this as, unless the club has a copy, I’m not aware of another one in existence. •	Palace played in Southern League Div 1 while the reserves played in the London League Div 1 and the Kent League Div 1. The reserves had scored 159 goals in 47 matches in 13/14 and Palace missed out on the Southern League Div 1 title to Swindon on goal difference. •	Admission was six old pence (3p) and another sixpence for a seat in the covered stand. •	Edmund Goodman was still both Secretary and Manager of the club. He was given credit that he ‘had practically organised the Club’ (since its founding in 1905) having previously been Assistant Secretary at Aston Villa for five years. •	The first owner of the handbook had filled in all the scores for the 14/15 season until 27th March. Was that when he was called up? There was also quite a bit about English (FA) Cup history as the Crystal Palace was then the venue for the final, including this fascinating description of the very first final. The handbook has some interesting photographs and I’ll post the centre spread on the next post. 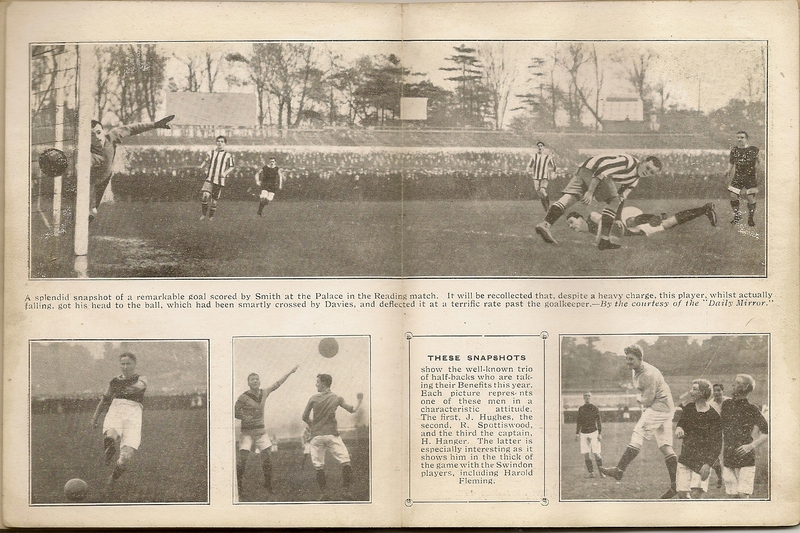 These photos were presumably taken in the previous season, 1913/14. The top photo is Palace v Reading at Crystal Palace. It looks as though some of the detail has been manually touched up. The lower photos include three players who were in their Benefits season. The centre and right photos, of Robert Spottiswood and Captain Harry Hangar show Palace in a kit which does not appear in the Historical kits for that time. Fantastic Phil, thanks for that, now I have something else to covet! Very interesting about the shirts being a reversal of the usual, I haven't heard that before. My oldest thing is attached on this and the next post, it's not an official Palace item as auch but was made by a bitter (but artistic!) Newcastle fan after we beat them in the Cup in 1907. Brilliant - I love all the old memorabilia! Artefacts like this are priceless and handbooks, like newspapers of the time, are the only record of finding out what the club was like back then. It looks like Andy Burton may have to update his historical kits! Thanks PPM, that's an amazing piece! Can you say how you came by it? Memorabilia from this era seems to be very rare and I would suspect because Palace were then in the Southern League rather than the Football League, they didn't produce stuff like programmes; at least I've never seen mention of one. Memorabilia for the very first Crystal Palace (1861-76) seems completely non existent. I can't even find a trace of any records, other than they apparently wore blue and white, which were the interior colours of the Crystal Palace itself. I've got my father in laws contract for Palace from 1945 and a poster naming a British forces 11 and there relevant clubs againt the French commando's.. I love the picture of the guy doing the nazi salute to the gay man.